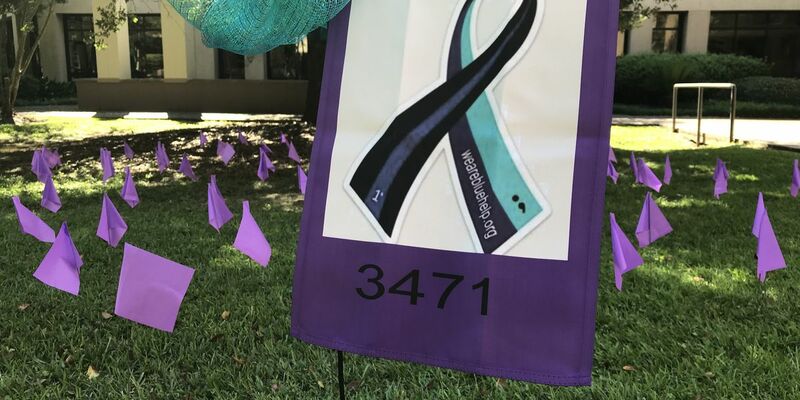 BATON ROUGE, LA (WAFB) - Ninety-two purple flags were placed around Baton Rouge Police headquarters Friday by a local collective of spouses and family members of officers in remembrance of those who committed suicide. The flags placed by the “Behind the Line” collective are intended to raise awareness of the unique stresses first responders face while on duty and ensure there are healthy avenues to release their stress. “Our first responders do not see the happiest of things that happen in this world and sometimes when you are not able to relieve some of that and come off of that superman mentality that we can take, all of the stuff we see every day, sometimes our cups filled up and there is no way to empty them,” said Sgt. Rendy Richard, an officer with BRPD. Of the 92 flags placed around BRPD headquarters, one represents BRPD officer Cpl. Bryan Thompson, a 14 year veteran of BRPD who killed himself earlier this year. A private ceremony among all law enforcement will be held this weekend to remember Cpl. Thompson and the 91 other officers.